Geared toward podcasters, videographers, live-streamers, YouTubers and beyond, these microphone/headphone bundles offer easy audio solutions. 145th AES Convention, New York, NY, — Audio-Technica, a leading innovator in transducer technology for over 50 years, is offering four new bundles catered to content creators, including podcasters, videographers, live-streamers, YouTubers, and beyond. Developed in direct response to customer input, these highly cost-effective bundles provide turnkey microphone/headphone solutions for all aspects of content creation. Two bundles feature USB outputs to directly connect with computers, while two feature XLR outputs for more flexibility to connect with professional mixers or digital interfaces. All bundles feature a microphone with mount, ATH-M20x Professional Monitor Headphones and a new custom boom arm with desk mount. 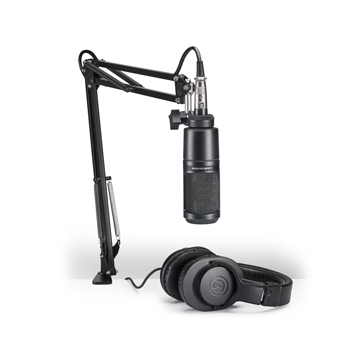 The boom arms are pre-threaded with the appropriate USB or XLR microphone cable compatible with the included microphone for a sleek, clutter-free appearance. 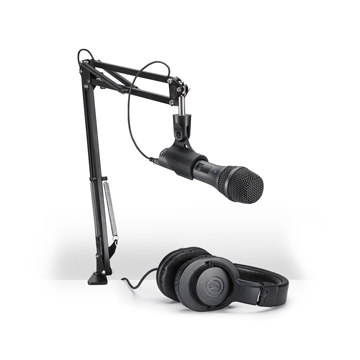 The AT2005USBPK bundle includes an AT2005USB Cardioid Dynamic USB/XLR Microphone with ATH-M20x headphones and custom boom arm. The AT2020PK bundle includes an AT2020 Cardioid Condenser Microphone, ATH-M20x headphones and custom boom arm. The AT2020USB+PK bundle includes an AT2020USB+ Cardioid Condenser USB Microphone, ATH-M20x headphones and custom boom arm. The AT2035PK bundle includes an AT2035 Cardioid Condenser Microphone, ATH-M20x headphones, custom boom arm and shock mount. Gary Boss, Audio-Technica Marketing Director, Professional Markets, “All four of these bundles offer a high level of value, with microphone models that have proven to be a hit with all manner of content creators in recent years. Whether your setup uses a separate digital interface or if you prefer to connect the mic direct via USB, we have you covered with these cost-effective bundles. ANOTHER SEASON is a true story based on recollections of actual events the author either witnessed or played a part in. Quotations from the characters in the book were paraphrased to enhance the story and voiced according to the author’s memory of actual conversations that took place at the time. Although most people might not recognize the name Charlie Calello, almost everyone will remember at least some of the songs he arranged, or produced. The discography of hit records that unfolds in these pages seems endless, and, indeed, it may not have ended yet. How these hits came about, along with triumphs and tribulations of the man behind all the music, makes for a remarkable story. That’s why friends and fellow recording artists have been urging Charlie for years to write his memoir. Calello has worked with Barbra Streisand, Frank Sinatra, Roberto Carlos, Neil Diamond, Al Kooper, Bruce Springsteen, Laura Nyro, Engelbert Humperdinck, the Cyrkle, Jimmy Clanton, Ray Charles, Bobby Vinton, Janis Ian, Barry Manilow, Juice Newton, Nancy Sinatra, the Highwaymen, Deborah Allen, and many others. Most recently he worked with the 2018 Top 10 hit piece “Raindrop” sung by 25 year old global pop star Ariana Grande - also named one of Time Magazine’s Top 100 most influential persons in the world.